A: Much less than any other option. Most jobs are finished in 2 – 3 hours. Q: How long with the refinished surface last? Q: Does Florida Refinishing offer a warranty or guarantee? A: Florida Refinishing offers an industry leading 5 years written guarantee for all of our work. Most refinishing companies offer warranties which are pro-rated, meaning coverage decreases incrementally over time. Unlike these warranties, our guarantee covers 100% of any defect in workmanship or materials throughout the entire life of the guarantee. 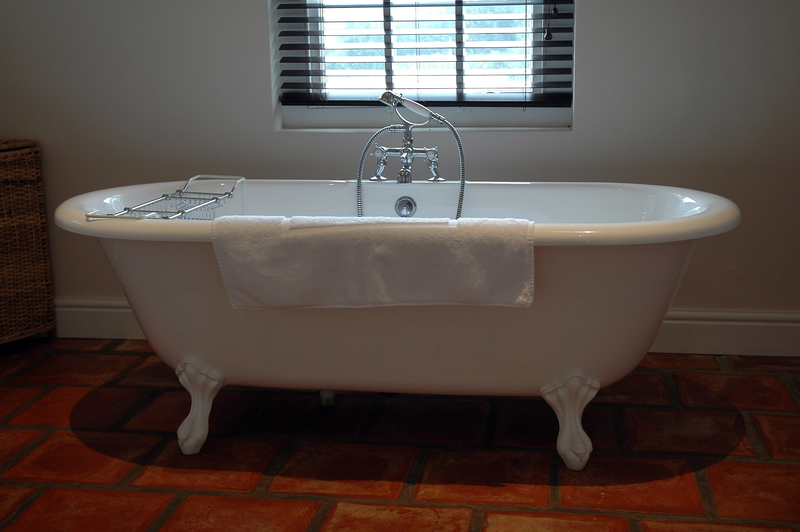 Q: How do I care for and clean my refinished bathtub? Q: Will my refinished bathtub look like it has been painted? A: This is a common myth in the bathtub refinishing industry. Your bathtub will not look like it was painted, since the material we use is a coating, not paint. In fact, our technicians pride themselves on the fact that it is quite difficult for an untrained eye to tell the difference between a brand new bathtub and one that has been refinished by Florida Refinishing. Q: Will my refinished bathtub smell like it has been painted? Q: Will refinishing work on my kitchen countertops? A: Our refinishing process works on a variety of countertop surfaces, including laminates, formica, tile, and cultured marble. It also saves your money; with our Stone-Flecks imitation stone finishing system, you can have that natural-stone look for a fraction of the cost of actual stone! A: Florida Refinishing offers a wide variety of factory-ready colors. With our custom color-matching technology, we can match the color of your other bathroom fixtures or you can request a color of your own! Q: How does the new finish compare to the original finish? A: The new finish will have the same appearance and feel as the old finish. We use a proprietary coating that bonds directly to the tub. Q: How long do we need to wait before using the tub? A: With our normal topcoat you can use your tub in 24 hours. With the premium topcoat in most cases you can use it the same day. Q: Can you make repairs too? A: We can fix cracks, rust, scratches, dull spots, chips, pits and discoloration in the refinishing process. Kitchens countertops with knife cuts, scratches, burns and chips will also look like new. Q: Is “reglazing” the same as “refinishing”? A: Yes, some areas of the country use different terms. Q: Are different colors available? A: Many standard colors are available along with an infinite amount of custom colors. A: Damaged fixtures are one of the most frequent reasons customers hire us. We can fix many of the most common problems. Call us and we can discuss your needs. Q: My previously refinished tub is peeling. What happened? A: The likely culprit is shortcuts taken during the preparation process. Poor preparation can weaken the bond between the tub and the topcoat. We meticulously prepare the surface so the bond is super strong resulting in years of use. Q: My fiberglass tub/shower is cracked. Can you fix it? A: Yes we can! We have several processes available. The best method matches the severity of the damage. Call us. We will discuss the damage you have and recommend the proper solution. Q: I saw a refinishing kit at a DIY store. Why can’t I just refinish my own tub? A: You could but it most likely won’t come out the way you envision. These kits usually have you apply a standard paint product with a brush or roller. The end result has brush marks, streaks or worse. The tubs look horrible. Most DIY kits use an epoxy coating that can take up to 5 days to dry and yellows significantly over time. Ugly. The mirror-like finish you really want cannot be achieved without proper training, experience and professional spray equipment. A: We refinish all three!